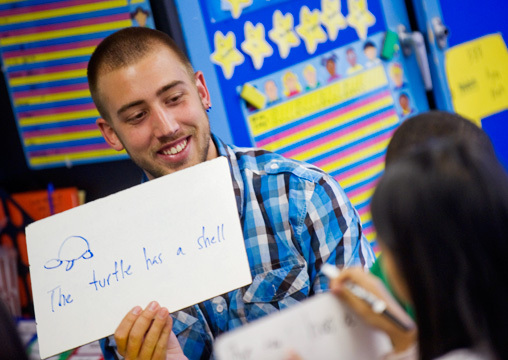 International student Oriol Gonzalez Robles, a social work major from Barcelona, works with children at the Doris Henderson Newcomers School. He teaches English to immigrant and refugee children as part of the Global Work with Immigrant Kids program. UNCG partnered with North Carolina A&T University to be part of an EU-U.S. consortium with the University of Maine, Orono, which received an EU-U.S. Atlantis Program grant for The Global Work with Immigrant Kids (GWIK) Project. This four-year grant supports student and faculty exchanges between European and U.S. universities and colleges. The GWIK Project is designed to educate new social service practitioners in direct care settings with immigrant and refugee children. Social work students compete for the opportunity to participate in semester-long exchanges, intensive language instruction, 15-week field internships and five courses. International students who came to UNCG during the 2009-2010 academic year completed a field practicum that involved community engaged social work with children and youth at the Doris Henderson Newcomers School. They also worked with children and families through community sites operated by the Center for New North Carolinians. The UNCG coordinator for the project is Dr. Cathryne Schmitz.